You are here: Home / Money / Business / Being on Top of Your Financial Obligations. Being on Top of Your Financial Obligations. (ThyBlackMan.com) Working with numbers can be intimidating and bringing money into the equation will cause most people to stress out. Today’s culture has pushed consumers to expect instant gratification in everything they do, including work and home. 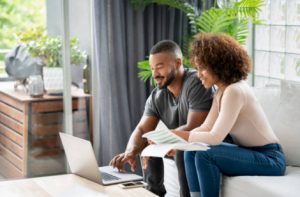 Slowing down to understand the smaller finite details of a personal financial situation can be an arduous process, especially for people looking for tax resolution services at the start of a new year. Money makes the world go round and a good place to start is to work smarter, not harder. When starting down the path to financial success, set short-term goals to meet instead of long-term ones. For example, make up a budget and stick to it while putting any extra bucks leftover into a bank account. Finding out where to cut costs can be a great way to save more money, like not going out to eat as often and cooking at home instead. Mid-term and long-term goals should be taken into consideration too, whether it’s paying off credit card debt, student loans, or just saving an emergency fund for the future. Maybe you’re saving up for a big wedding? Who knows. Tax season on its own is intimidating because it’s a culmination of a person’s hard work over a one year span. The financials of a lifestyle, business, contracted work taken on, risks taken, etc., are all laid bare for the IRS to pick over before mailing out the paperwork. People can be overwhelmed from the sheer amount of information and number crunching necessary to file each year. Thankfully, there is a way to stay ahead of the curve without crashing and burning the second tax season comes knocking again. Everyone’s financial situation is different, so the information for each person’s tax situation can vary. Parents or guardians will need to claim any dependents they have, homeowners will need to figure out how much tax to pay, etc. Everyday receipts can suddenly become valuable since depending on a person’s financial status they can get itemized deductions from the IRS. The bottom line is this: any paperwork or information having to do with taxes, be sure to collect and organize. Some people hire an accountant to take care of the finer details for them, but other options like keeping e-files saved to a hard drive or a backup is another way to go. Just remember to have copies of important documents in case of an emergency, or have them ready if you need access to them when filing. CNBC shared information a while back about what happens when people don’t file their taxes. It’s fair to note there are different penalties for not “filing” taxes versus “not paying them.” People filing to get a refund from the IRS may face the penalty of not receiving their full refund if they file late. Those who file their taxes but don’t pay can face the consequence of failing to pay their taxes which can result in having to pay penalties. to pay their taxes and soon it can become overwhelming trying to get ahead of the financial tsunami. People caught up in a dire situation like this can feel as if they don’t have any power when dealing with the IRS. This is why people will refer to a tax professional to help them since they know the ins-and-outs of the IRS. The right tax professional can help negotiate with the IRS to deal with debts, penalties, and overall make the situation more manageable. They can help people file for appeals, negotiate a payment plan for unpaid taxes, secure penalty forgiveness, and more. Negotiating tax season doesn’t have to be a nightmare each year. It can be a breeze with the right preparation. Keeping vital information, files, and paperwork on-hand, for example, will make it easier to access when it’s needed. Referring to a tax professional for issues with the IRS will help take off the stress of navigating this confusing field of caution tape that most people will mentally put up the moment taxes are involved.